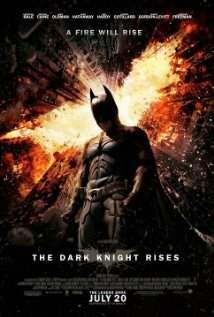 The film is the final installment of Christopher Nolan's Batman trilogy. It sees Gotham eight years after the death of Harvey Dent, with cleaner streets. Batman/Bruce Wayne (Christian Bale) has become a recluse, having had to take the fall for the murders Harvey Dent committed in the previous film. However, beneath the city, an army is gathering under the command of a terrifying new villain, Bane (Tom Hardy), and Bruce is forced to return. When Bane captures Batman and imprisons him as he traps Gotham's residents, overthrowing all order, things don't look great for our much loved hero. But in a wonderful reference back to Batman Begins, (and Bruce's training with Ra's Al Ghul, where he is taught to overcome his fear), he must learn to fear death again in order to save his city. There was so much I enjoyed about this film, whether it was the moving scenes with Alfred (Michael Caine), Catwoman's (Anne Hathaway) character arc, the much anticipated appearance of Tahlia Al Ghul (Marion Cottilard), or the familiar well-delivered amusing one liners (Batman: 'So that's what that feels like'), it was an enthralling film. Watching it is imax gave the stunning shots of Gotham City a special grandeur, and I could even feel the explosions beneath my seat, the sound was so loud. But what makes Nolan's final installment so brilliant (as is the case with the previous films), is that it transcends the super-hero genre. Bane's form of terrorism strikes a poignant note in contemporary society, and I felt a real understanding of the people who were punishing the wealthy and powerful who had treated them so badly. Bane's team of villains was made up of ordinary working men, alongside criminals. I'm not advocating laying entire cities to the ground, but this need to recognise the injustices of Gotham's society is something a contemporary audience can definitely relate to. Another thing I loved (that I will sadly not have on a second viewing) was the complete tension. Knowing Nolan's dark take on the Batman story, there was a part of me that was genuinely concerned about the future of Gotham. Fortunately, the film built to a wonderful dramatic crescendo, and concluded absolutely perfectly. As the film ended, the audience applauded and the lovely lady who sat next to me in the front row said: 'Thank you for sharing this experience with me'. That statement pretty much sums up how I felt about the film; it was a magical cinematic experience that the kept a packed cinema utterly enthralled throughout. As an aside, there is loads more I wanted to mention in this, so comments on what you thought of the film are most welcome!